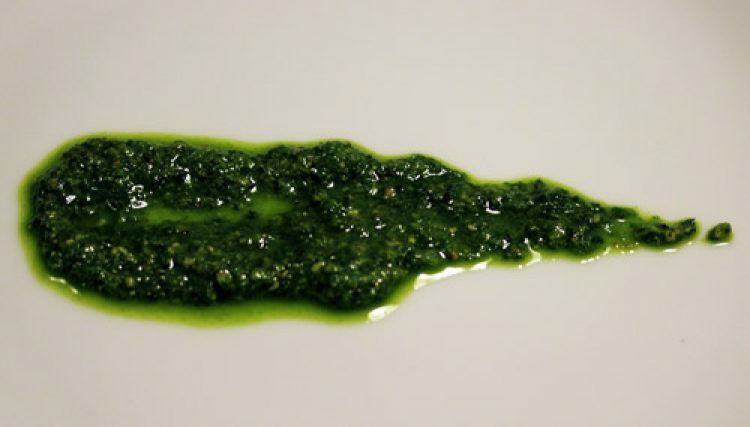 Pesto. It’s one of the great summer treats. Fresh, pungent basil from the garden, mixed with garlic, Parmesan cheese, pine nuts, and a liberal amount of EVOO. Traditionally, of course, it’s used as a pasta sauce, but it also works great on grilled chicken or fish, swirled in dipping oil for bread, as a sandwich spread, and surely many other creative methods. Nowadays, of course, one doesn’t need a herb garden to get pesto. It’s available in the supermarket year-round, both in the uninspiring jarred form as well as a somewhat better fresh format. In addition, we’re lucky enough to be blessed with quite a few excellent Italian specialty stores in this area, that almost always offer up their own fresh versions. Pondering this one day, I wondered: who makes the best? A taste test was the obvious and inevitable result. Despite being raised in an Italian-American family, I never had pesto as a kid (not even once). We were Southern Italians, of course, and pesto is from Liguria, on the Italian Riveria, in Northern Italy. The first time I tried it was actually in Genoa, Italy, pesto’s birthplace. I was just out of college, backpacking through Europe, and decided to take a short detour to the Ligurian capital to visit a family friend. He had a small, cramped apartment, but it was a welcome respite from the dingy hostels we had become used to. “Do you guys want to go out for dinner, or just eat here?” he asked. Having eaten every meal at a restaurant for at least 15 straight days, that was a very easy decision for us. A meal at home was just the ticket. It wasn’t even fully home-cooked; my friend ran out to the local market and came home with three things: fresh potato gnocchi (another thing I’d never had), fresh pesto, and a loaf of foccacia that was so drenched in olive oil that its bag was soaking wet. What a wonderful combination of ingredients it was! The basil in the pesto exploded with fragrance, and the sauce managed to be delicate and powerful all at once. The pillowy gnocchi absorbed said sauce with ease, and we forced every last drop down. It was a simple meal, but easily the most memorable one on my month-long trip, and one that completely changed my life. Now, it’s rare that a week goes by without pesto of some kind or another finding its way into my belly. But back to local matters. Let’s have a taste test. Though there are surely quite a few local choices, I picked three of my favorite Italian specialty stores in the area — Carlino’s of Ardmore (and West Chester), Luigi and Giovanni’s of Newtown Square, and Sassano’s of the Strafford Farmers Market (and Paoli) – grabbed a container of their homemade pesto, and got to work. Because freshness is paramount for good basil, and thus good pesto, I made sure to visit each store on the same day that we consumed the pesto, to ensure the best quality product. Unfortunately, on this particular day, Luigi and Giovanni’s was out of fresh pesto, and only had it frozen. Though this was surely disappointing, it added an interesting twist to our little test. Would the frozen pesto stand out like a sore thumb, or would it hold its own? Now, without further ado, the results! It was immediately evident from looking at this pesto that it was the frozen one. Its color was a dull green, and it had a similar look to cream of spinach. Its aroma was also quite muted, with very little of that pungency that fresh basil always delivers. Visually, this was a different class from the frozen pesto. It was a vibrant green, and the chunkier of the two, with visible whole pine nuts and large specks of cheese. Aromatically, the basil stood out more than the L&G version, but it still lacked some of the vibrancy that basil just out of the garden offers. From a visual standpoint, this was even brighter green than the Carlino’s sauce, and there was an abundance of EVOO around the sides (which can only be a good thing). Aromatically, it was as close to the garden as we got – bursting with fresh basil aromas and lots of bright, aromatic garlic. This brightness translated to the taste as well. Basil was clearly the dominant flavor, green and pungent, with plenty of garlic. There was even hint of toasty pine nut flavor! This tasted like pesto that was freshly made just before it was put on the table. Absolutely outstanding, and the clear winner in all 4 categories.